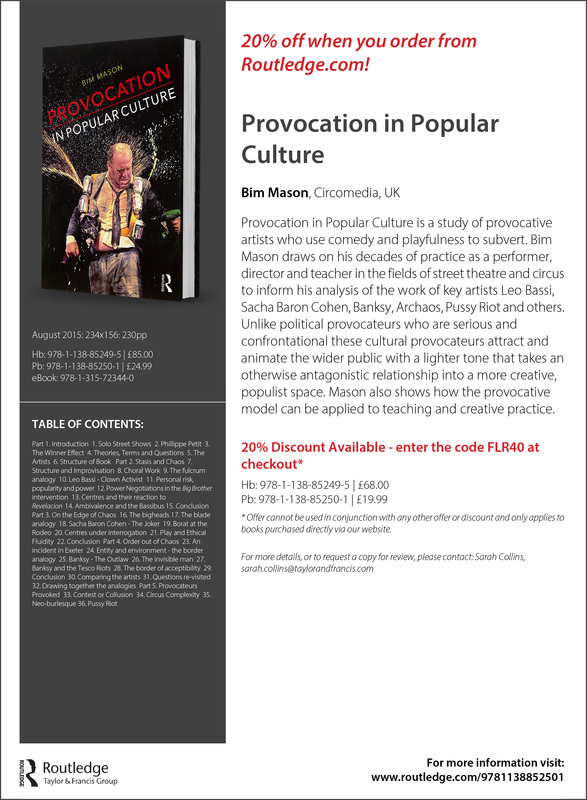 Provocation in Popular Culture is an investigation into the practice of specific performance provocateurs and the wider nature of cultural provocation. It aims to articulate what occurs and demonstrates how provocation can play an important function in the process of renewal, both for individuals and for societies. In particular it examines provocateurs who work in popular performance because the fine tuning of practice has to be more acute to be widely acceptable and because the effects are more far reaching. It examines the work of Banksy, Sacha Baron Cohen, the clown-activist Leo Bassi, Philippe Petit, Archaos and others. It also draws on Mason’s own work over thirty years as performer, teacher and creator. It explores different kinds of challenge and forms of popularity, the power negotiations involved in the relationship between a provocateur and those who are provoked and the implications of maintaining a position on an ‘edge’. Using neuro-science as a bridge, it proposes and uses a similarity between complexity theories and cultural theories of play and risk, in so doing arguing for a correlation between the two approaches. It arrives at three, inter-related analogies of ‘edge’ which reveal the shifts between structure and fluidity in practice, the ambivalent combinations of these in a single moment and the potential opportunities and problems of this combination.